K.L. Security has made its customers aware that paper shredders should be considered security items, not just a piece of office equipment. Another aspect of that is to understand that many models of paper shredders can be used for more than just disposing of paperwork. Sensitive information is no longer just on paper products; companies often use CDs and DVDs to store everything from client names and credit cards to bank account numbers. DVDs and CDs cannot just be tossed in the trash; even if you have erased them, scratched them up or smashed them. Smart and determined thieves can often retrieve data from disc that only has cosmetic damage. There is a security question that you should ask yourself; should my company or home office stick with a paper-only shredder or do we need a model that thoroughly destroy CDs and DVDs and other forms of multimedia as well? Here is a list of pros and cons of each type of shredder. Shredding Speed: paper-only shredders will go through documents faster; shredders that focus on or have the multimedia option will go slower; electronic media is tougher then paper. Warning! 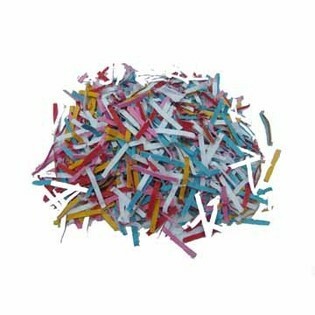 There is a danger to trying to shred discs/plastics in a paper-only shredder. You could be hit with a wave of potentially sharp bits of former credit cards and computer discs as well as damage the cutting cylinders of your current shredder. Before you shred any plastic or media, check to make sure your shredder is rated to shred it! Bag Changes: Shredders that destroy DVDs/CDs often require a separate bag or bin for the chopped-up plastic and metal bits. There is a reason for that; it is more environmentally responsible; electronics often go to separate disposal areas for recycling. Maintenance: paper-only shredders require various levels of maintenance depending which style of cutting head they use; mostly different levels of oiling. Since shredders that can destroy plastic have tougher cutting heads; they need more maintenance and controlled use. Regularly scheduled oiling is a necessary element. Security: in this area you need to decide which type of shredder you need. If you think that your primary concern should the destruction of multimedia then go with a dedicated model that can provide the heavier cutters needed. If your company or office is paper-oriented then go with a cross-cut paper shredder. There are many crosscut shredders that also support multimedia shredding. It’s best to consult with an expert first! 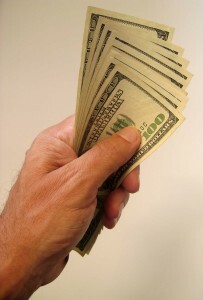 Price and warranty: Price is often an important factor but don’t overlook warranties. Top-shelf manufacturers will have the cutting heads on their shredders covered from ten years to life. Product quality goes a long way with the return on your investment and the warranty is a reflection of that quality. Here is a list of companies that manufacture both paper and multimedia shredders. Doing a job right requires the right piece of equipment. Tossing your paperwork and multimedia into the garbage without properly destroying it is too much of an identity theft risk. Shredders aren’t only for paper anymore. There are models that can destroy computer discs, DVDs, CDs, prescription pill bottles, credit cards and hard drive parts. One final piece of advice, many brand name manufacturers offer combo models that can switch between multimedia and paper modes. Be certain to ask the right questions and learn how each of these models shreds the different materials as well as learn the most you can regarding ratings and warranties for the cutting heads. Which Makes the Best Cut? Whether at home or in the office, there is a matter that should concern you, the disposal of paperwork. Even you no longer need a certain piece of information, someone else might want it. It is 2012 and everyone is aware of the danger of identity theft, the US Federal Trade Commission estimates that 9 million cases of identity theft take place in the United States alone. There are myriad ways to defend your personal information but you can’t afford to end the fight at the garbage can. When deposing of paperwork that contains financial, personal or otherwise sensitive information; it is important to render them unusable to those who would desire that information for their own ends. One of the best ways to accomplish this goal is to use a paper shredder. Paper shredders are not a new invention. The first patent for one was issued in 1909 and they have been mass-produced since the 1950s. It wasn’t until the mid-1980s that they came into major use among non-governmental entities when the Supreme Court ruled that the 4th Amendment does not prohibit warrant-less search and seizure of garbage placed outside of a home or office. Shredders quickly became popular due to privacy concerns. Since then the law, environmental concerns, identity theft and industrial espionage have made them even more omnipresent in the workplace and home. There are several different models of paper shredders. From small ones that can fit over a wastebasket to huge commercial designs that shred thousands of documents per hour; there are even top-secret models used by such government agencies as the NSA. The two types of shredders we’ll be discussing are the cross cut and strip cut designs and what are the pros and cons of each design. The strip cut models use rotating knives to cut narrow strips as long as the original piece of paper. Cross cut models (also called confetti cuts) use two contra-rotating drums to cut the paper into rectangular, parallelogram or diamond-shaped sheds. Speed: in this category the strip cut model wins out. The cross cut is slower because it cuts the paper into more pieces. Bag changes: the advantage is the cross cut design because the smaller pieces. Far more can fit into one refuse bag because the shredded are smaller than the strips. Maintenance: Shredders require regular oiling to function properly. Strip cut machines require less oil then cross cut ones because they are cutting less. 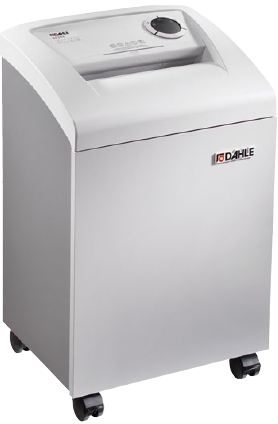 Dahle has recently released the CleanTEC paper shredders that all have automatic oiling features. Security: This one should be your primary concern. Cross cut models offer far more security because they cut the paper into smaller shreds that are virtually impossible to piece back together. The cut paper produced by strip cut machines can (and in several cases have been) pieced back into their original form by determined people. Price: Cross cut machines are generally more expensive then strip cut models. This question should be answered by considering how much paper shredding that you need to do. It’s up to you to decide which factor is the most important aspect in your decision to buy a shredder. Here at K.L. Security, we want to make sure you have all the facts about your security products and believe us; shredders are security products. Protect your clients, personal information and vital paperwork; shred them when you toss them! Shred Paper, CDs and DVDs with Dahle! Dahle’s new CleanTEC paper shredders are a cut above the competition thanks to some groundbreaking new features that are guaranteed to raise a few eyebrows. Here’s what you can expect. The newest and most impressive innovation is the CleanTEC filtration system. It traps up to 98% of the fine dust that is produced under normal shredding conditions. The particles are funneled through an enclosed system to a filter at the back of the machine and permanently bound together. This means you are guaranteed a cleaner and healthier workplace for your employees. Safety features also get a significant upgrade with the CleanTEC range. A voice command option allows you to activate an emergency shutdown with the word ‘Stop’, and the same action can be achieved by tapping the pressure sensitive top cover. 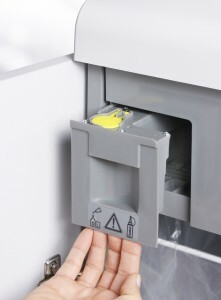 You will even find electronic sensors around the blades that cease shredding operations when they detect the presence of fingers near the cutting blades, and an extra emergency shutdown button is located on the back of the paper shredder. The new Electronic Sensing Protection is able to sense how many sheets of paper you are trying to shred at one time, and will not allow you to exceed the maximum load for each machine. An LED command dial gives you a visual indicator of how close you are to the maximum capacity and helps to ensure that paper jams are a thing of the past. Additional controls will alert you when the shredder bin needs emptied, or when the particle filter needs replaced, and some models even include automatic oilers to save you time when maintaining your shredder. You don’t use your paper shredder all the time, but the chances are high that you still leave it on all day. As convenient as this may be, it wastes energy and adds to your company’s utility bills each month. Dahle’s new CleanTEC lineup has a solution for just this scenario. Its SmartPower Energy Management System automatically goes into standby mode after 10 minutes of inactivity, and goes one step further by eliminating all power usage after being dormant for 30 minutes. So, if your current paper shredders have seen better days, now is the time for an upgrade to the Dahle CleanTEC. Call our customer service representatives today for a free quote on a new, state of the art Dahle paper shredder. The new line of Dahle CleanTEC paper and media shredders are the most advanced shredders ever manufactured. The CleanTEC namesake is derived from the new air and dust filtration system which removes 98% of the fine dust that is created from paper, cd-rom or dvd material, reducing Indoor Air Pollution and improving air quality. In addition to the dust filtering system the new CleanTEC document shredders are at the pinnacle of the shredding food chain. Let’s take a look at the new EvenFlow Lubricator feature. As with many of you, when we hear EvenFlow, we think of Pearl Jam. A new Dahle CleanTEC shredder, just like Pearl Jam, is a well oiled machine. Gone are the days where your shredder fails because everyone in your office expects that the next or last guy oiled the shredder. With the transition to cross cut shredding machines, the need to keep your shredder oiled on a regular basis is an absolute must. Failure to oil the machine regularly, with the proper amount of oil, and you will find yourself in a constant cycle of purchasing new shredders. When do you oil your shredder? How much oil? And, who is in charge of oiling the shredder? In the past, all of these questions had to be answered in order to keep your shredder running properly. Now, just follow these simple steps! Remember to keep a close eye on the oil indicator light, located next to the power button. When the light comes on, repeat this process!